How Quick Can Nico Hischier Make an Impact for the Devils? Nico Hischier made history: he was the first Swiss-born player to be drafted No. 1 overall in the NHL Entry Draft. The New Jersey Devils also made some pretty crazy headlines: they won the first overall pick with just an 8.5 % chance to do so, compared to a team like the Colorado Avalanche who had an 18% chance to take the coveted draft position. For a team like the Devils who were last place in the Atlantic Division (the first time they were last in a division since the 1985-1986 season in the old Patrick Division) will Hischier be able to bring something to the New Jersey table? Being noted as a strong two-way player with amazing hockey sense can help any rebuilding team. Question is, how soon can an impact be made? The Devils are looking for something more than just a run of the mill season. Their last Stanley Cup Championship was in 2003, and their last playoff journey was in 2012. Since then, there have been no tastes of playoffs or the silver cup. With some other strong offensive players, such as Taylor Hall and Travis Zajac, could they finally make it back to April with the Stanley Cup Playoffs? It’s never a good thing when there is already a monkey wrench in the plans in the fact Zajac is out for 4-6 months recovering from pectoral surgery. There have been plenty of other articles and stories about Nico Hischier: the player he is, the type of guy he is, who he’s played for, what he did, etc so here’s the cheat sheet. He made heads turn in the Elite Jr. A league while in Switzerland, helping him get drafted No. 6 in the Canadian Hockey League Import Draft. His dominant play-style, and ability to be not only a two-way forward, but a scoring forward, came apparent in the Quebec Major Junior Hockey League with the Halifax Mooseheads. Playing 57 games, he came away with 86 points in the regular season (38 G, 48 A), and then seven points in six playoff games (3 G, 4 A). He led all QMJHL rookies in goals and points. Along with the selection for the QMJHL Rookie All-Star Team, he was named the QMJHL Rookie of the Year and received the Michael Bossy Trophy as the best pro prospect in the league. The cherry on top, he was named the rookie of the year for the entire CHL. He has also played internationally for Switzerland in both the World Junior Championships (as the youngest player on the team and second youngest overall), along with the U18 World Championships and other numerous tournaments. He has a total of 28 points in 32 international games. A Swiss-Hit or a Swiss-Miss for New Jersey? This could be a hit or miss, hence the title, for the New Jersey Devils. Is there a reason that a Swiss-born player has never been drafted first overall? He may have been good in the junior system and the Swiss leagues, but does that hard work translate to the National Hockey League? A rookie like Hischier doesn’t just come in and carry a team on his shoulders instantly. He requires a team around him to help decide if he was a good choice at No. 1, or if he was a bust. He has the support for sure, looking at the roster for the upcoming season. Hischier will have the incredible Taylor Hall, who finished last season with 53 points (20 G, 33 A). He has newly signed Drew Stafford as well, but he is inconsistent; so the Devils will have to see if he will be suitable to be on a line that could potentially be the top scoring line for them. He’ll have Ben Lovejoy behind him on the blue line, along with Hobey Baker Award winner Will Butcher, who announced on August 27 that he chose New Jersey as his NHL team, after finalizing his top five earlier. Based on how everyone comes together, this team could either climb out of the Eastern Conference basement or they could also have absolutely no chemistry and end up right back where they were; if not worst in the entire league. Right now, it seems like Nico Hischier could be a hit for the Devils, but it’s based on the rest of the team. A two-way forward could really help their defensive core. Not only that, but Hischier could be one of the many young players coming in this season that could bring back strong play to New Jersey. Myself, Ben Grieco: “Nico Hischier comes from a pretty rough draft class. This wasn’t a draft class like the past couple years, with Connor McDavid and Auston Matthews being taken first. While he will be able to rack up minutes on a struggling team, New Jersey was lucky to even get the first overall pick. Will it be a Swiss-Hit or Swiss-Miss? Over the Top Rope: Episode XV | Summerfest! 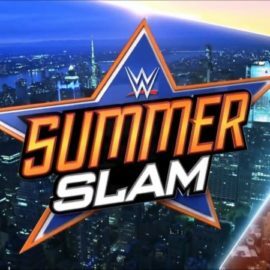 I Mean, SummerSlam!